Smart Card World provides a range of smart card solutions and primarily works to provide solutions for cashless catering in Education - schools, colleges, universities and businesses, and also to provide turn-key loyalty solutions for all sectors of business, including retail, salon & beauty and the restaurant and hotel industry. Unlike standard credit, debit and loyalty cards, that have the ordinary magnetic strip (swipe type of card) - smart cards use microprocessor chips which are available in 8, 16, and 32 bit architecture. Prior to embedding, a cavity is formed or milled into the plastic card. Then either a cold or hot glue process bonds the micro-module to the surface. A smart card's data storage capacity ranges from 300 bytes to 32,000 bytes with larger sizes expected soon due to new semi-conductor technology advances - as their ability to download not just data but applications is currently being advanced by Sun with JavaCard technology. (see Javaworld). Smart cards can also use ferro-electric memories which are the latest in recording technology. Current smart cards carry about 250 kilobytes of memory, which is enough to store substantial amounts of varied information, like for instance their bearer's medical history; which can then be used by doctors, pharmacists or even paramedics in an emergency. Smart cards can also hold information like: the indentities of pupils in a school, college or university, or of employees/personnel who work for an organization or company. As well as being an ID card, a smart card can also be used to pay for goods like: petrol, public transportation, general retail stock, meals at a restaurant and drinks at a bar. Also un-like the magnetic strips on credit cards, smartcard memories do not come in contact with their readers and therefore do not wear out from overuse like magnetic strips do. Users can load smartcards with cash value(credit) to pay for goods or services: known as an electronic purse. 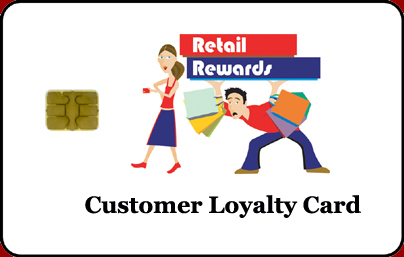 Or they can collect points in order to receive discounts: known as a loyalty card. Reduction in tampering and counterfeiting - due to high security mechanisms. Storage capacity is increased by up to 100 times. The anticipated working life of a smartcard is ten years compared to that of a magnetic stripe card at three. Smart Cards within the next five to ten years will be the industry standard in debit and credit cards. As the major high street banks and finance houses are now investing in the change over to smart card technology. Tolerance to temperature and flexibility. The position of the electrical contacts and their functions. How the integrated circuit communicates with the outside world. There are several types of plastic used for smart cards. The main types are PVC (Polyvinyl Chloride) and ABS (Acrylonitrile Butadiene Styrene). PVC can be embossed but is not recyclable; whilst ABS cannot be embossed but is recyclable. As part of Smart Card International's total solution, we can print cards to any customer specifications. Cards can be personalised with whatever design or logo the company wishes; and they can be printed on both sides in either single colour or full colour. We also have no minimum order quantity.